It was so much fun to see these little waffles come to be, especially during week eleven. This week has been intense! I do not know if it is because next week is a short one with Thanksgiving break, or if it is because students are more willing to take risks with their art making, or if it is because this current challenge did not allow them to use a material they have already used... but I have to say that the kids in my classroom are making some wonderfully surprising works using all kinds of materials, many of which is their first time using in the classroom. The current challenge is asking them to think about the objects we use in our lives and how the things we own reflect the values we have in our culture and society. It has been interesting to see students respond to this prompt visually and create works based on that. We also did a printmaking demo this week, which opened the whole world of Gelli Arts printing plates and the wonder of mono printing as well as block printing. I also did a wheel-throwing demo and introduced students to felting, coding, and our tech kits we got over the summer through DonorsChoose. I am excited to see where students go with these pieces as we finish them up when we return from Thanksgiving break and how they will use their new creative courage and art-making skills to propel them to their last projects of the semester. Ellyse worked on mono prints this week, using wood feathers to create texture and a relief element with her series. Lainey gave block printing a try to show off one of her favorite sports. Jake wanted to work with our Ozobots that were recently acquired thanks to a DonorsChoose project in August. Zander worked with creating a drawing machine using LittleBits circuit kits that was acquired thanks to a DonorsChoose project in August. Kennedy was one of many students who tried the Google coding challenge through DonorsChoose this week. It was fun to get them working with programming using Scratch. This was a great intro activity for what will be the next STEAM challenge before winter break. I also spent this week doing wheel demonstrations and students were eager to give it a try. This was another awesome result of DonorsChoose a few years ago! This dress was completed by a student using aluminum foil and trash bags. It is always interesting to see how students interpret this project. I also did a silk screen demo this week using Mayco printed screens. I purchased a variety of sets a few years ago after a conference where I was able to demo them. It was fun to see a couple of students bring in their own canvases to apply them to. It was great fun to see students actively engaged in the various tools to create works of their choice. I look forward to seeing them finish these at the end of the month. As you can read from the captions, so many of the items that students engage in while working in my classroom have been a result from funded projects on DonorsChoose. We currently have a new project posted that is getting matching funds through the Carnegie Corporation. If you are able, we would love to have your support to fund our project "Mobile Masterpieces: A Fine Arts Night Family Activity." ​I am excited to put these materials to use and add to the collection of great work my students are doing. Since starting this blog 5 years ago, I have been looking for new and different ways to share all of the things that go on in our Art room. I used to post daily and more recently have moved to less and less posting. For this school year, I am hoping to post weekly about what we are working on and how we progress through learning, making, and exploring along the way. For the past five or so years, I have opened up the first day with clay. We use this opportunity to make our bowls for our annual Empty Bowls event. I am so thankful to work in a community that supports the Arts and that we can in turn support the community through our Art in action. Our Arts a la Mode Night will happen on May 23rd this year and I know it will be even better than last! 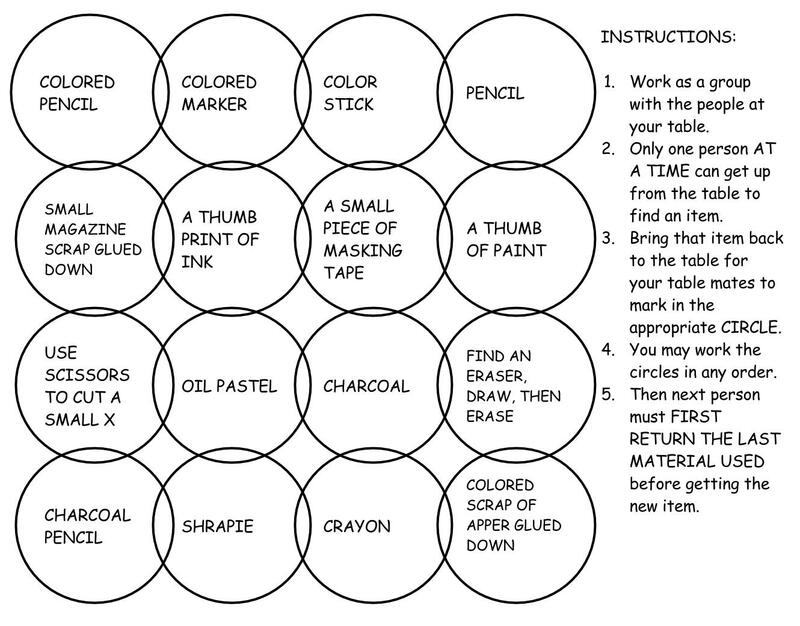 In addition to getting students immersed in making art with clay on the first day, I leverage this act of making on day two as I introduced "The Dot" by Peter H. Reynolds. I have been doing this one for a few years, too, in different forms. I am really in love with students making their own mark after being inspired by the story and then bringing it all together to make something larger than their single part. I hope that can see the symbolism in that as we tackle many challenges together throughout the semester and will need each other to get through many of them. Here are a few of the finished ones and the classes put together to make larger "dots." Aiden: The Dot story tells us that no matter how bad you think you are at art, there are a million different ways to make your art work unique. It connects with my art because I didn't know what to make so i just started making different lines and circles and it turn out pretty good. Abby B.: A story, known as, “The Dot”, has a theme, that can be interpreted that anyone can be an artist. The story starts as a young girl has trouble on thinking about what she should make for her art class. Her teacher tells her to make a dot, which she does, still frustrated with herself. But when the teacher puts it in a frame the next day, the girl keeps working on more dots, surprising herself with her own creativity. I found this book to be funny and inspiring, and a good message to think about when you work on art. This story helps connect with the current piece I’m working on, known as, the dot. I believe that this project was given to us to show that we can be artist too, know matter what our skill levels are. There are a lot of things we can feel good about that got accomplished this week. And with that in mind, I know there will be so many things to look forward to overcoming this year. This week we got to see the 3D printer in action, relive the accomplishments of the past as a challenge to the future, and get excited about our first STEAM collaborative starting on Monday! I had an awesome summer of unwinding and unplugging because I know this year will be a big one. We have a lot to live up to from the past and instead of being daunted by it or feeling overwhelmed, it is a challenge to push harder and reach higher! I hope everyone else who started their school year feels that same determination in their gut and leverages it to their best year yet! This week marks a fresh start in Art Teacher world. A new semester means class changes and new groups of students, most of whom have never had me as a teacher before. So far this week, we have worked with clay on the first day, signed up on Schoology, and started getting our portfolios in order. I also started a new class with my Dual Enrollment students this Spring. I have been teaching for KCAD in the Dual Enrollment for about six years. This is the third time I have taught Color because we alternate offerings for our students each year. This is also the first time that all the students enrolled have had be as a teacher in the past - many as a part of my After School Art Class. It has been a delight to start again with these guys and see how they have grown in their talents. I am especially excited to see them develop their understanding of color through skill based drills into more creative expressions. After School Art students are also hard at work with their class banner. This year they decided to use Emojis for their #classof2020 sign to hang in the cafeteria. And finally, I want to thank all of the readers out there who have been stopping by to check out our work. Thanks to those who voted, this blog just got a 3rd place finish in The Art of Education Blog of the Year contest. I started this blog as a way to reflect and share - it has really become such a fun five years of writing and posting! Tempera paint is a great stand-by for students and teachers alike. This paint comes in a variety of colors and absorbs into the bisque wonderfully. You know exactly what you are going to get because the colors dry the color they look and you do not have to worry about ruining brushes or mishaps on clothes because it is a water-based non-permanent solution. I usually buy the large Gallon Tempera paints and then pour them into smaller bottles (like these from Blick I just purchased and LOVE) for students to distribute on their pallets. I try to give them the rule of pouring "three colors at a time, the size of dime" as to not waste paint. Watercolor is the paint that solves so many problems! Like tempera, it is a water-based material that will not destroy brushes or clothing and it ends up looking exactly how you view it. Because of the play on opacity, you can layer colors and create so many effects with this material. I use Prang watercolor pallets that are at least a decade old because I like how easy it is to replace colors once they have been used. This method is relatively new to me. I first learned of this technique on the Art Teacher Facebook group. A generous teacher shared the results of using oil pastel on clay with a watercolor/tempera wash and I was immediately intrigued. I find that this works best on textured clay, like the creature above (the student used a bright blue oil pastel and then used a darker watercolor over). When you use oil pastel on clay, it acts as a resist to the water-based paint, resulting in a beautiful effect. In order to make the finishes selected by students permanent, we used a clear-gloss acrylic paint and dabbed it over top. it is important to dab, rather than paint, to prevent smearing. The gloss goes on white, but dries clear and gives the pieces a nice shine while locking in the color.